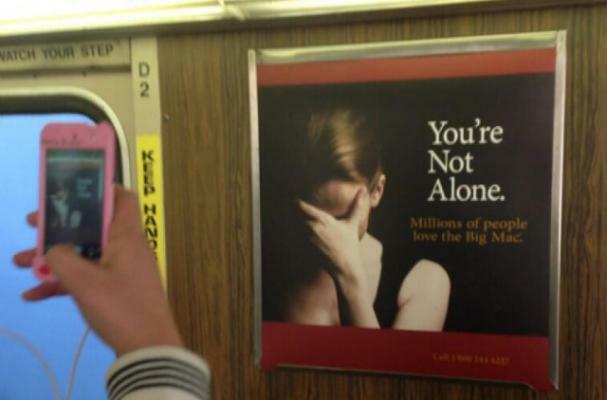 McDonald's caused controversy when they released an advertisement (pictured above) of a woman, seemingly depressed with the words "You're not alone," written beside her. Underneath, in a smaller font, the ad reads, "Millions of people love the Big Mac." The ad also features a 1-800 number which leads callers to McDonald's head office. The ad from the fast food chain caused outcry, as many felt it was inappropriate for McDonald's to poke fun at public service ads for mental health issues. According to a statement in Time magazine, McDonald's says the ad in question was never approved, blaming an error in the marketing process. "We can confirm this ad was not approved by McDonald's. We have an approval process in place... Regrettably, in this incident, that process was not followed. We sincerely apologize for this error." The agency that created the ad, Arnold Worldwide, also released an apology, calling the issue an "unintended error."